Loudon, New Hampshire, Sat. 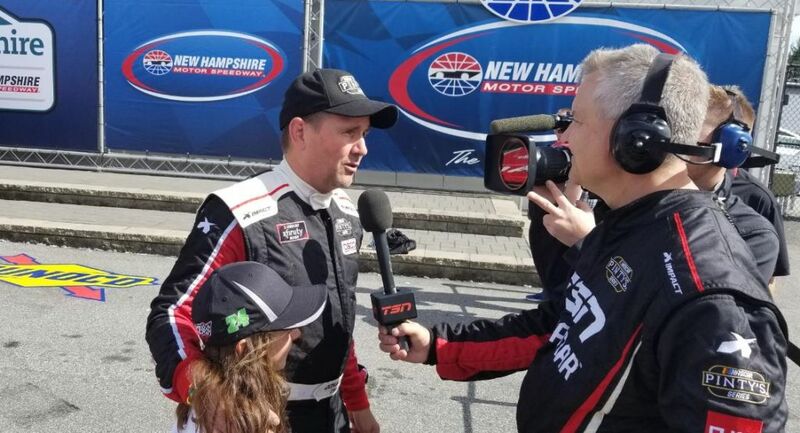 Sept. 22, 2018: Donald Theetge driver of the #24 Mercedes-Benz/Circuit Acura Chevrolet Camaro ZL1 fought and battled his way through to a podium finish on Saturday in the Visit New Hampshire 100 at New Hampshire Motor Speedway. This was the first appearance by the NASCAR Pinty’s Series outside of Canada and was run in conjunction with the K & N East Series and the Whelen Modified Tour in an event titled New Hampshire Full Throttle weekend. Practice and qualifying would take place on Friday and Theetge was happy with his car right from the start of practice just wanting minor adjustments from his crew to make it a little more stable. Once practice was complete and he was being scored as 5th quickest he and crew chief Greg Gibson discussed what else they could do make the car just a little better. Gibson made a call to make one more change. This adjustment maybe cost them a little time in qualifying – 7th overall, but they knew the car would have great long run speed for the 100-lap race. Theetge started the Visit New Hampshire 100 on the inside of row four was quickly able to move up in the running order. By lap 20 he was into the 4th position and gaining on the front runners. From the third position, the team elected to bring Donald down pit road for extra fuel. Everyone knew the race distance was going to mean the teams would be close on fuel and a complete restart after the field took the green flag at the start, resulted in six additional laps being run, making it too close to take a chance. When the race went back green, Theetge was deep in the field but started his charge back to the front and when 100 laps were complete he was credited with a 3rd place finish. For the first time our Canadian fans were able to live stream the race on tsn.ca or the tsn app but if you missed it the Visit New Hampshire 100 will air on TSN on Saturday Sept. 29th at 1:30 p.m. and on RDS 2 on Tuesday September 16th at 10:30 p.m.
Donald Theetge is supported by the following sponsors: Mercedes-Benz St Nicolas, Circuit Acura, Antidote, V Télé, Le Soleil, XPN World et Québec Automobile Esthétique.